We’d love your help. Let us know what’s wrong with this preview of Winter in the Soul by Jennifer Novotney. In a world divided by power and greed, seventeen-year-old Lilika harbors an intense desire to return to Winter in the Soul, the place her family left to escape the darkness that was manifesting from a coldness of the soul. When she meets Talon, their connection is evident right from the start, and together they travel through the Black Kingdom to recover Lilika’s stolen loc In a world divided by power and greed, seventeen-year-old Lilika harbors an intense desire to return to Winter in the Soul, the place her family left to escape the darkness that was manifesting from a coldness of the soul. When she meets Talon, their connection is evident right from the start, and together they travel through the Black Kingdom to recover Lilika’s stolen locket. And in search of an answer to the mystery behind Winter in the Soul. To ask other readers questions about Winter in the Soul, please sign up. I was excited to read, WINTER IN THE SOUL, as the title made me wonder if this book was about an eternal coldness of the soul or just about a winter that never ends. The answer is much simpler than that... Winter in the Soul is a place, a very dark place. Lilika is a a seventeen-year-old young woman who has lived a very sheltered life. One day she discovers a golden locket and soon discovers the locket is her destiny. She keeps it hidden from her family and doesn't show it to anyone. She meets Tal I was excited to read, WINTER IN THE SOUL, as the title made me wonder if this book was about an eternal coldness of the soul or just about a winter that never ends. The answer is much simpler than that... Winter in the Soul is a place, a very dark place. She meets Talon and there is an instant connection. Her heart beats faster and she soon starts to have feelings for him. 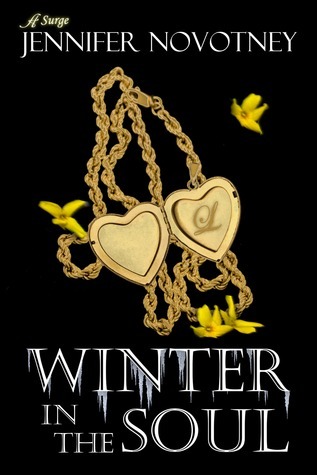 When she shows him the golden locket, their fates are intertwined. An old man steals her locket and together, Lilika and Talon enter the Black Kingdom to get it back. WITS is an enjoyable read and I love the main characters, Lilika and Talon. The romance is blossoming between the two and it is sweet. It took awhile to get into the action part of the story and I loved the descriptive narration of Lilika. With each encounter, I felt what Lilika felt and I cringed when she cringed with fear. The only downside was that it ended too quickly and abruptly. Based on the book blurb, I was expecting a big battle between Lilika and the darkness. I guess that is what book two is for. One of the most beautiful things about this story is that it is a world divided by seasons--Spring Blossom and Summer Harvest must be protected from the bleak and frigid emotional darkness of Winter in the Soul. There are two love stories in this book--the blooming romance between Lilika and Talon, but also the sweet father-daughter relationship between Lilika and her father, Sage ("...she loved hearing her father's voice tell the tale of how they made their home in Spring Bloom..."). Jennifer o One of the most beautiful things about this story is that it is a world divided by seasons--Spring Blossom and Summer Harvest must be protected from the bleak and frigid emotional darkness of Winter in the Soul. There are two love stories in this book--the blooming romance between Lilika and Talon, but also the sweet father-daughter relationship between Lilika and her father, Sage ("...she loved hearing her father's voice tell the tale of how they made their home in Spring Bloom..."). Jennifer obviously has a talent for literary fictional the descriptions of the landscapes and imagery shine brightest in this book. Lilika's love interest is a young man with integrity ("...there was no time to get lost in a daydream now; he had work to do, and time was ticking") and though the action escalates, he doesn't think ever once of abandoning Lilika as she carries on her quest to find the true origin of her locket ("...it was like a little bit of sunshine in her palm..."). Peppered in are wonderful bits of wisdom (from Talon: "Sometimes, another life looks more interesting than your own just because it is new and unfamiliar, but we all have our shining moments and our daily work..."). Winter in the Soul is good story not to be judged by its cover. The cover doesn’t reveal much, but the story is a great adventure-high fantasy, with magic becoming a focal point toward the end. I really, really liked the story line, it is fresh take in the high fantasy/magic genre. The second half of the story read at way too quick a pace. The main characters are 13-14 years old. The story feel more geared in the juvenile age range (8-12yrs) rather than the young adult genre (13-16yrs.) I think young readers just getting into high fantasy will really enjoy this book. This book hits the juvenile reading level right on the mark. The relationship between Lilika and Talon starts quick, but seems appropriate. Talon is pure chivalry. I like his character and we got to know some about him, but i want to know more and get a little more into his character. Lilika is flighty and is a doer before she is a thinker. Best way to describe her personality, is “on a whim.” She is curious and brave, and her personality shows off well start to finish. She wants to be responsible, but her actions are often misguided and create much of the adventure of the story. The story started off with good detail and set up. Lilika is introduced and immediately finds the locket, she goes to school and does chores and we get a decent feel for her. She accompanies her father to the market in the town of Summer Harvest, about a half days carriage ride away. Talon, the other main character, is introduced at his home, an inn in summer harvest. We get some background to him and his story. Some detail aside, they get to the market for trading day and then shortly after that the story slams on the gas pedal from there till the end. The book is 130 pages according to my e-reader. I think the story needed another 100 pages of minor details; segues and transitions and minor and background details. The second half of the story felt like an outline of the major events taking place in a bigger story. I wanted more ‘in between’ content to link things together and provide some continuity. The first 11 of the 21 chapters were paced well and had good detail; the second half of the book is those 100 pages need to be added. Take chapters 12-13, 11 pages total, as an example. I felt like 6 major story events happened in these 11 pages, pretty much a major event every page and a half. The very end met the same speed up, where I though the culmination of the story spanned too few pages. My other critique is there were a few inconsistencies and some unanswered questions for me on the reader end; most of these stem back to the fast pace and my want of more minor detail. An example would be how far is Winter in the Soul from Summer Harvest? The characters walk there over the course of those 11 pages, which indicates it is very close, and Lilika and Talon do not rest or eat along the way. Everyone speaks as if it is a hard place to get to, and I got the impression it was far away. The rest of my questions come with the ending chapters, so I will omit them to not to be a spoiler. I’m curious to see what towns lie past the few we were introduced in book one, since there are only 4 seasons, and three have been used. I also want to learn more about the magic. How are the protectors of the lockets bound to them, the extents of magic use in WITS, and so on? This young adult fantasy takes us on a journey of discovery with Lilika as she first finds a mysterious golden locket; then, the world outside her home town of Spring Bloom; next, an engaging young man named Talon; and ultimately, her destiny. We feel her growing anxiety as she sits on the road alone, guarding the cart that carries to market both the harvest and the hopes of her friends and neighbors. When she hears the approach of someone in the surrounding darkness followed by a friendly voice, we feel her initial shock, and then we feel her relief. Throughout the story, Novotney offers a full range of experiences, from excitement to terror, from new friendship to new love, from doubt to determination. Winter In the Soul presents an entertaining tale of good versus evil that leaves just enough questions to make us wonder how long we’ll have to wait for the sequel. I look forward to watching Jennifer Novotney’s progress as a writer and to reading what happens next to Lilika and Talon. Couldn't put it down! Great balance of action and romance. Highly recommend!